What a great month its been for fundraising. Firstly we would like to say thank you to everyone that took part in our online Christmas auction, whether it was through donating or bidding. We raised over £750 for this alone! We had some beautiful designs for our Christmas card competition, it was really hard to pick the winners! Thank you to all the children that took part. Your designs have been printed and sold well, this really helped to raise lots of pennies. We have also had some of you that made the decision not to send cards this year but to donate to our charity instead. This is very much appreciated and means a lot to us all. We'd also like to say a massive thank you to each and every one of you that joined in with our fundraising by wearing your Christmas jumpers to work. 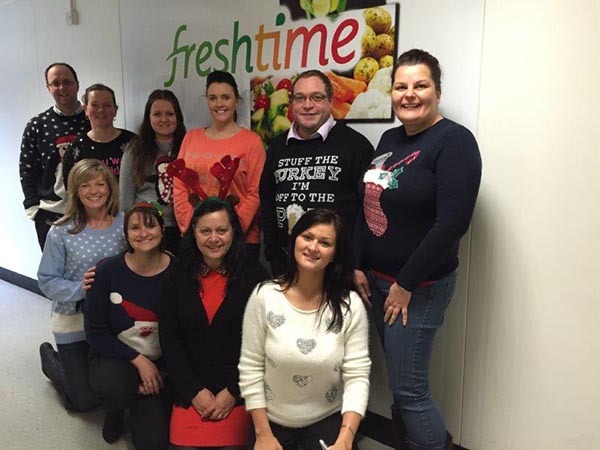 Here's just a few of the Staff from Freshtime UK who wore their Christmas jumpers to help raise funds for the Ally Cadence Trust! Thank you everyone, you all look very festive.